Translation Services USA will primarily augment two areas of Spirinet’s service offerings. First, they will provide website translation. Secondly, they will provide software localization services, which is the process of adapting existing software platforms to fit the needs of specific language and cultural groups. “Spirinet has always been international in scope, but our partnership with Translation Services USA will allow us to serve an even broader group of clients, and make sure that cutting edge technology is available to all, no matter what language they speak.” From words of Alex Buran, President and CEO of Translation Services USA: “Partnership with Spirinet will open up many possibilities never seen before. Sometimes, when we are serving the needs of our large companies, we have to scale up our IT solutions rather quickly in order to accommodate the most demanding needs. This is where Spirinet comes handy and we look forward to working with them”. Spirinet Technology Services was founded in 2005, and is a premiere provider of IT outsourcing and consulting services for small and medium-sized businesses all over North America. They are headquartered outside Boston, Massachusetts. The partnership with Translation Services USA is just the latest in a long line of innovative technology solutions. One such solution is AppsOnDemand, which leverages cloud computing to deliver applications to SMBs, anywhere, anytime, on a pay-per-user model. Translation Services USA was founded in 2002 as LeoSam Translations. They are based in New York City, New York, and count many Fortune 500 companies as their clients. Like Spirinet, they are international in scope, and can translate to and from over 150 languages. For more information, please visit Spirinet’s website at ComputerSupport.com. 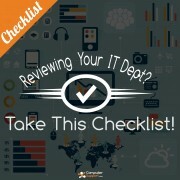 Evaluating Your IT Department? Take This Checklist! very nice and helpfull information i found here.The translation service is really very helpful to me. Exchange 2010! Take these as priorities for your computer security!